Lance Armstrong Makes First Post-Scandal Appearance: "I Thought I'd Reintroduce Myself"
Cyclist spoke at a cancer conference following the USADA's decision to strip him of his Tour de France titles. Lance Armstrong, seen here in a file photo, makes first public appearance since U.S. Anti-Doping Agency announced it would strip him of his seven Tour de France titles and ban him from cycling for life. 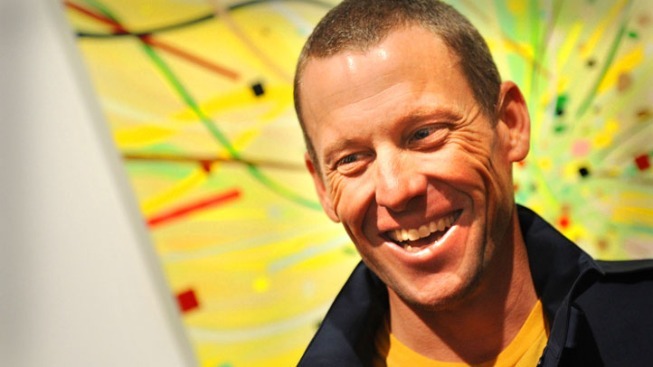 After announcing last week he would no longer fight the doping charges against him, Lance Armstrong made his first public appearance post-scandal, introducing himself as a Tour de France champion at a cancer conference in Montreal Wednesday. "Good morning....in light of recent events I thought I might reintroduce myself," the cyclist told the audience. "My name is Lance Armstrong. I am a cancer survivor...I'm a father of five. And yes, I won the Tour de France seven times...and for those who have no idea what I'm talking about...I love you." The U.S. Anti-Doping Agency confirmed last week that it would strip Armstrong of all of his record-setting seven Tour de France Titles and ban him from cycling for life, after he declared he was done fighting the charges. "There comes a point in every man's life when he has to say, 'Enough is enough,'" Armstrong wrote on his website. "For me, that time is now." The 40-year-old athlete went on to say at the conference he would not let his current circumstances keep him from fighting against cancer. "I think the real issue here is one of distraction," Armstrong said. "I'm not going to be distracted from this fight. The global burden is too big...Thank you all for having me. Livestrong everybody."